(RRP £99.99). Strikingly elegant matching shoes and clutch bag in black faux suede – perfect for spring, summer outfits – or any time of year. The open-toe slingback high heel shoes have a 4.25 in stiletto heel, mini platform sole, single ankle strap and a delicate black and white sheer fabric rosette detail over the toe. The clutch bag has matching fabric detail on the front. It also has a detachable chrome shoulder chain, a double press-stud fastening with top zip and black satin lining. Note: The shoes are shown in the images with a white tie across the ankle which is just to hold the shoes in shape for the photograph. (RRP £99.99). 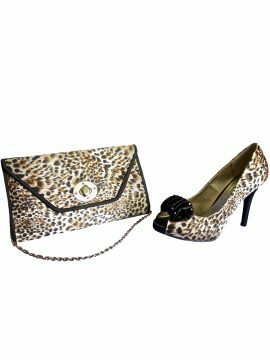 Elegant and eye-catching stiletto matching shoes and clutch bag. Both shoes and bag are in black faux suede. The stiletto high heel slingback shoes have a delicate black and white fabric rosette over the toe while the matching clutch bag has a striking black and white pattern on the front. It also has detachable shoulder chain so you can carry the bag over the shoulder if you wish. Made by Lunar.